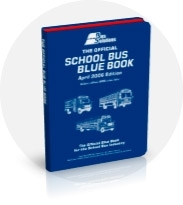 This Official School Bus Blue Book is a complete used school bus valuation guide. Bus Solutions has been providing professionals with accurate used school bus pricing information for more than ten years. The book gives you benchmark pricing on thousands of used school buses throughout North America and Canada. In addition, the publication has great historical value providing information regarding both manufacturing dates and specifications. Used properly, the Official School Bus Blue Book can help you maximize profits when selling and keep you from overpaying when purchasing used school buses. WHAT KIND OF INFORMATION IS IN THE BOOK? Nationwide average retail and wholesale values for all school buses produced over the last 15 years. Detailed schedules for options, engines and transmissions. Published annually in April. The values are reflective of actual sales transactions during the previous year.